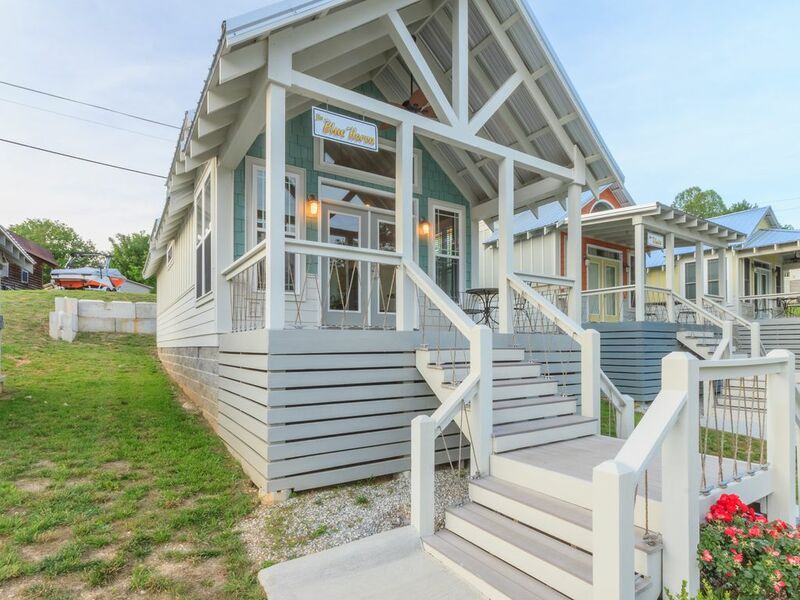 The Blue Heron is a brand new addition to the Cottages of Indian River. The Blue Heron is located just across the street from Indian River Marina and offers everything you need for your lake home away from home . . . fully-stocked kitchen for the cook, satellite TV in the living room and bedroom for the entertainment buff, WiFi if you must check your email, and a covered slip for your boat. If you don't want to trailer your boat or don't own one, rent one from us so you enjoy all 800+ miles of shoreline that the lake has to offer. Debbie Samples has owned Indian River Marina for 22 years. When she married husband Chuck, a contractor/builder, they embarked upon increasing the marina's footprint by adding the Cottages of Indian River. Although our weather was crazy rainy, our stay was wonderful. Beach cottage feel during a wet rainy weekend. Will come back in the summer- thank you! What a great little place! Everything is new with beautifully designed finishes. The outdoor patio/shelter space was a nice plus. My husband and I stayed in the middle of the week so it was quite peaceful. I loved that it came with a boat slip (it was a little hard to find from the boat because they are not marked on the outside). Debbie was great to deal with, always responding quickly. We will definitely stay again! This is the cutest, cleanest, and most quiet place I’ve ever stayed. Loved that we could put our kayaks in right at boat docks a short walk away. It’s everything we needed and wanted for a comfortable long weekend away in beautiful TN. 1. Add dish towels to kitchen. 2. W-D 40 the hinges on bathroom door so it doesn’t wake up others at night. House is beautifully designed. Plenty of space in the living room to relax. Great kitchen. Bathroom is great with a very nice shower. Bed is really comfortable. Highly recommended. Everything we needed for a nice, long weekend. Unit was exactly like the photos and contained everything we needed. Nice that little things like coffee filters and dish soap were provided. Small but very nice and comfortable. Great location with easy drive to town. Great place to stay on Norris Lake. We will definitely be back. The cottage was well decorated and very clean. We spent most of our time when at the cottage relaxing on the front porch. It was a short walk to the marina and it was great having the covered boat slip. Of the 3 marinas we stopped at, Indian River Marina had the cheapest gas. The employees were very friendly there as well. This part of the lake is not as busy which made it that much more enjoyable. Overall, a great place to stay.